After a meeting with Karl Landsteiner in 1936, Linus Pauling began serious investigations into the link between antibodies and antigens, compiling notes for what would eventually become his serological series, a collection of fifteen papers published during the 1940s. Landsteiner had specifically piqued Pauling’s curiosity on the question of the human body’s specificity mechanism – e.g., how could the body produce antibodies tailored to lock onto and fight specific antigens? Pauling ultimately surmised that the answer lie in the shape of the molecules, and in the type and number of bonding sites. He described this as a “lock and key” mechanism, otherwise termed as molecular complementarity. Throughout this project, which made a significant impact on the modern study of immunology, Pauling enlisted the help of many undergraduate, graduate, and doctoral students, including a promising young scholar named David Pressman. David Pressman was born in Detroit, Michigan in 1916. He attended Caltech as an undergraduate, studying under Pauling and completing his degree in 1937. He stayed in Pasadena for his doctorate, earning it in 1940. During this time, he became a part of Pauling’s quest to unravel the structure of proteins, and was particularly involved with the antibody and antigen work. By this point, Pauling and his colleague Dan Campbell felt confident enough in what they had learned about antibody specificity to attempt creating artificial antibodies. Pauling was enthusiastic about the practical application that such an endeavor might promise for physicians. Warren Weaver, Pauling’s primary contact at the Rockefeller Foundation, which was funding the work, cautioned Pauling against becoming overconfident, but still granted him enough money to hire Pressman full-time. Thus began Pressman’s career in immunology. At Pauling’s request, Pressman stayed on at Caltech as a post-doc, and during this time the two became friends. In 1943, after failing to prove that they could synthesize antibodies, Pauling’s research team changed their focus from understanding the structural components of antibodies and antigens, to looking for the binding mechanism that allowed antibodies to attach to specific antigens through Van der Waals bonds. One outcome of this was their development of the theory of complementarity, a “lock and key” model in which molecules fit together because of the high levels of specificity that they show for one another. Pressman authored three papers with Pauling during this phase, including a very important one titled “The Nature of the Forces between Antigen and Antibody and of the Precipitation Reaction,” published in Physiological Reviews. In this paper, the researchers discussed the historical significance of immunology within the context of structural chemistry. Speaking of the tradition in which they worked, Pauling and his colleagues wrote that “two of the most important advances in the attack on the problem of the nature of immunological reactions were the discovery that the specific precipitate contains both antigen and antibody, and the discovery that antibodies, which give antisera their characteristic properties, are proteins.” In this paper, they also theorized that the immune system depends on structural and chemical forces to function. 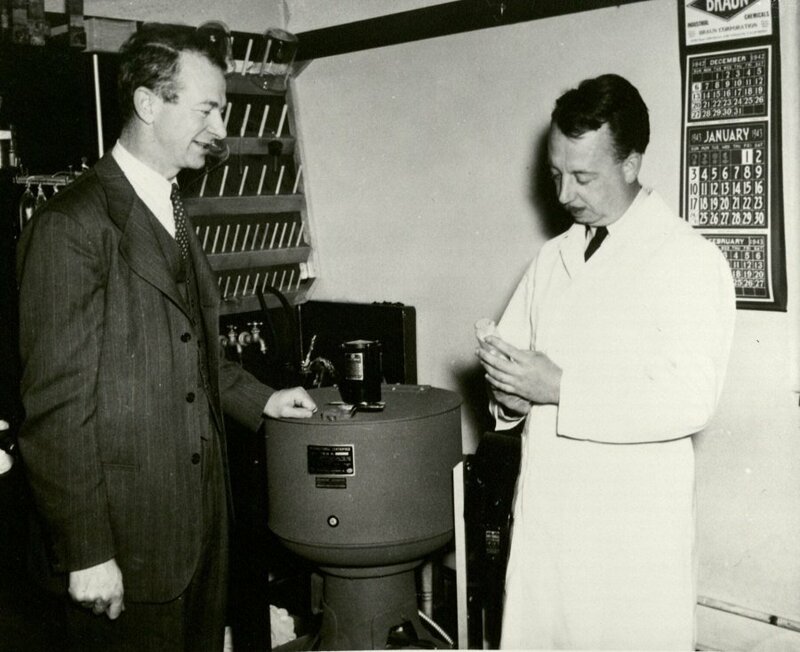 Pressman (at right) in the lab, ca. early 1960s. Pressman’s first few years at Sloan-Kettering were difficult, not only because of the nature of the research that he was conducting – a continuation of the research that he started with Pauling – but because he was frequently forced to move both his lab and his residence, a source of continuous disruption for himself and his family. Sloan Kettering had just been established in the early 1940s and wasn’t formally dedicated until the year after Pressman moved there. Though it eventually became one of the nation’s leading biomedical research institutions, Pressman’s early experiences there coincided with institutional growing pains. Eventually, as the environment at Sloan-Kettering became more stable, Pressman settled in to his position and provided Pauling with regular updates on his progress. The two often traded manuscripts back and forth, and each solicited technical advice from one another on their specific endeavors, which gradually grew further afield as time moved forward. At Kettering, Pressman continued to study antibody specificity and explored the potential use of radioactive antibodies for tumor localization to develop immunotoxins. In 1954, he left New York City for the Roswell Park Institution in Buffalo, remaining there until his death. 60th birthday greetings sent to Pauling by David and Reinie Pressman, February 1961. Pauling and Pressman remained in frequent contact for many years, focusing their voluminous correspondence primarily on work that Pressman continued to do as an outgrowth of their time together in Pasadena. In July 1961, Pressman wrote that he and a colleague, Oliver Roholt, had potentially made a breakthrough with regard to the sequencing of the polypeptide chain associated with the region of specific binding sites in antibodies. He sent his manuscript, “Isolation of Peptides from an Antibody Site,” to Pauling for review prior to submission to Proceedings of the National Academy of Science. Pauling felt that the manuscript had been put together too quickly and challenged Pressman to do better. He annotated the manuscript with numerous suggestions, most of which Pressman adopted. Less than a week later, Pressman sent the manuscript back to Pauling with the corrections and Pauling transmitted it in to PNAS, where it was received favorably. The late 1960s were a period of great activity and advancement for Pressman. In 1965, he received the Schoellkopf Medal, a prestigious award granted by the Western New York section of the American Chemical Society. In 1967, he became assistant director at Roswell and, in 1968, he published a book, The Structural Basis of Antibody Specificity. By all outside indications, Pressman’s life was going well. In 1977 however, tragedy struck when Jeff Pressman, David and Reinie Pressman’s son, committed suicide at the age of 33. Jeff was an up-and-coming professor of political science at MIT, where he was well-liked by faculty and students. Up until a few months before his death, Jeff had seemed happy, both with his career and his life at home. In a letter to Pauling, Pressman described Jeff’s descent into depression as sudden, severe, and uncharacteristic. He also documented the events leading up to his son’s suicide, conveying that he and his wife had become increasingly convinced that the responsibility for the tragedy lay at the feet of a rheumatologist to whom Jeff had been seeking assistance for back pain. Believing Jeff’s back pain to be primarily muscular in cause, the rheumatologist had prescribed Indocin in January 1977. According to multiple sources that Pressman later consulted, Indocin was a mood-changer, so much so that other patients had reported sudden depressive symptoms and, in severe cases, committed suicide a few months after starting the medication. To complicate matters, the rheumatologist had increased Jeff’s dose to a level that few patients could tolerate well, and had done so more rapidly than was advisable. When Jeff began complaining of insomnia, the rheumatologist prescribed two additional medications, both of which had the potential to worsen his depression. Jeff finally stopped taking Indocin, but the effects lingered. Jeff’s wife, Katherine, reported that Jeff had felt increasingly hopeless about his depression, even though he continued to work at MIT up until his death. David Pressman’s former secretary, Cheryl Zuber, posing with a plaque mounted in Pressman’s honor at the Cancer Cell Center, Roswell Memorial Institute, 1981. Nonetheless, the loss took its toll and, for David Pressman, the only source of solace that he could identify was a return to work. In 1978, his focus in the laboratory was on localizing radio-iodinated antitumor antibodies. He later wrote to Pauling about chronic shoulder pain that he was experiencing, as he was aware of Pauling’s vitamin research and was in search of an alternative to the shoulder replacement surgery that had been recommended by his physician. Pauling put forth an argument for a megadose of vitamins, but Pressman was eventually diagnosed with osteoarthritis. By the end of the year, he was slowing down, both in his work and in his correspondence. I was very fond of David. Also, I owe much to him, because of the vigor and effectiveness with which he tackled scientific problems during the eight years that he worked with me. Much of the success of our program in immunochemistry was due to his contribution. Linus and Ava Helen Pauling, Oxford, 1948. 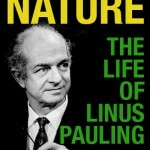 By the Spring of 1946, having published no fewer than twelve articles – over a little more than three years – on the serological properties of simple substances, Linus Pauling’s busy life began to get in the way of continued advancement of his research program. Perhaps chief among competing interests was a separate fifteen-year joint research program, funded by a $300,000 grant, that Pauling and George W. Beadle, the head of Biology at Caltech, were in the midst of setting up. Pauling had also returned to studies of sickle cell anemia with the arrival of Dr. Harvey Itano in the fall of 1946. He was likewise engaged with new inquiries in inorganic chemistry that reached a crescendo with a famous article, “Atomic Radii and Interatomic Distances in Metals,” published in March 1947. From there, the dawn of 1948 saw Pauling moving to England, where he served as George Eastman Professor at Oxford University. Not long after, he received the Presidential Award for Merit for work done during World War II. Clearly there was much going on in Pauling’s world. 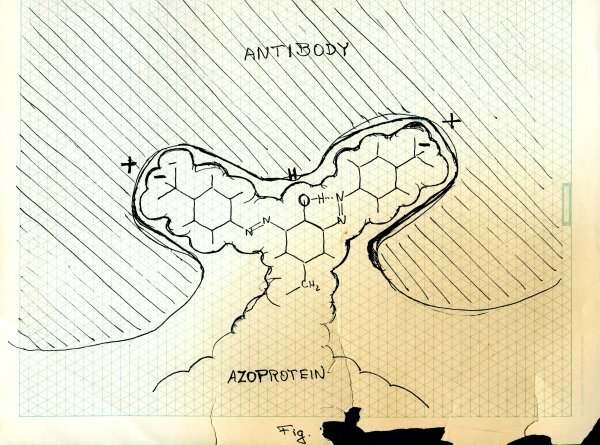 Drawings of antibodies and antigens made by Linus Pauling in the 1940s. Nonetheless, consequential progress continued to be made in the serological program with the thirteenth paper – an important one – coming into print in April 1948, while Pauling was still in England. This article, written by Pauling along with David Pressman and John Bryden, marked a continuation of the precipitation experiments that had been carried out in the previous two papers, but this time with a different antiserum and antigen substitute. The Paper XIII experiments determined that antibodies are rigid and cannot change shape to bond to a different antigen. Significantly, these data also confirmed that structural complementarity was responsible for the reaction’s specificity, affirming Pauling’s early notions of a “hand in glove” fit. Furthermore, the paper’s findings established that the principal forces involved in the complementary bonds were Van der Waals interactions – very weak bonds induced by sheer proximity. In short, the experiments verified the importance of intermolecular interaction in the specificity of serological reactions, a significant breakthrough. With Pauling now having returned stateside, the year 1949 saw the publication of the final two serological articles, one released in January and another during the summer. Paper XIV, written by Pauling and Arthur Pardee, was fashioned as a response of sorts to disagreements that had been expressed by other scientists concerning Pauling’s interpretations of his experimental results. The paper specifically focused on experiments utilizing simple antigens and purified antibodies, rather than the antisera that Pauling had been using. These trials found that, although the behavior of simple antigens was different when matched with purified antibodies rather than antisera, “…the earlier work, carried out with serum, is presumably reliable.” In making this statement, Pauling and Pardee cited the non-specific combination of dye molecules along with other components of the serum for past results that had varied slightly. The last article in the serological properties series, Paper XV, appeared in the Journal of the American Chemical Society in August 1949; Pauling and Pressman were its authors. The article detailed the results of experiments using an antiserum with two or more positive charges. This experimental set-up, Pauling hoped, would allow him to determine the difference in combining power between antibodies containing only one negative charge as well as those containing two negative charges. The duo discovered that the antibody would only combine strongly with antigens that contained two negatively charged groups in specific positions. From this, Pauling concluded that the attraction between the negative charges of the antigen and the positive charges of the antibody are very strong. After completing the fifteenth paper, Pauling largely left immunology behind in favor of the work that he and Itano were doing on sickle cell anemia. In 1950 and 1951, Pauling and several collaborators also published multiple articles delineating protein structures. In addition, it was during this time that Pauling began to really ramp up his peace work, delivering more and more lectures on the topic as the years went by. The fifteen articles that comprise Pauling’s serological properties series were published over a span of seven years. During that period, Pauling worked with twelve collaborators, several of whom were graduate students. By the conclusion the project, hundreds of experiments, using dozens of compounds, had been run. For fifteen years…until a new, more powerful theory of antibody formation was put forward, Pauling’s idea led the field. His antibody work again expanded his growing reputation as a master of many fields. Indeed, Pauling’s work with antibodies was influential even outside of the field of immunology. In 1990, journalist Nancy Touchette declared, “In his 1946 paper [“Molecular Architecture and Biological Reactions”], Pauling prophesied about the future of biology and medicine and why understanding the nature of complementarity is so important to the future of the field.” Five years later, at a Pauling symposium held at Oregon State University just a few months after Pauling’s death, molecular biologist Francis Crick stated flatly that Pauling “was one of the founders of molecular biology.” Once again, Linus Pauling had revolutionized a scientific field while following his curiosity and intuition. The results of the experiments, with particular attention paid to the twenty-six hapten molecules, were then discussed in the context of their possible molecular structure. In this discussion, Pauling pointed out that some of the polyhaptenic molecules did not produce participates, a detail that was explained as having been caused by steric hindrance, or the inability for a reaction to take place due to molecular structure. David Pressman was again a co-author of the paper, as were two graduate students, John T. Maynard and Allan L. Grossberg. Grossberg would stay with Pauling’s lab until 1946 – two years after completing his war-time master’s degree – and was involved with three more papers from the series. He later went on to work with Pressman at the Roswell Park Memorial Institute and eventually became associate chief of cancer research there. Pauling’s immunological work was quickly producing exciting new results, momentum that was recognized by The Rockefeller Foundation, which awarded Pauling another grant in June 1943. Pauling also began delivering lectures on his serological research, notably including the Julius Stieglitz Memorial Lecture in January 1944. Articles six, seven, and eight of the serological series were each published a few months apart from one another, beginning in March 1944. Pauling co-authored these papers with previous collaborators Pressman, Campbell and Grossberg, and also with Stanley Swingle, a research fellow and instructor who had earned his Ph.D. at Caltech in 1942. In the seventh paper, published in May 1944, Pauling returned to the simple theory for calculating the inhibition of precipitation that he had developed in Paper II, published at the end of 1942. In his discussion, Pauling reported that his laboratory’s experiments found general qualitative agreement with the theory, but the numbers tended to be off. In seeking a more reliable equation, Pauling worked to improve the theory, accounting now for the fact that a single antiserum can contain slightly different antibody molecules with assorted combining powers. This new and improved theory, and the equation that accompanied it, agreed with experimental results much better than had the original proposal. Indeed, by accounting for variations in the antibodies, Pauling and his colleagues had succeeded in developing a “quantitative theory of the inhibition by haptens,” which would prove important to much of the work that was to come. Paper VIII, “The Reactions of Antiserum Homologous to the p-Azobenzoic Acid Group,” appeared in October 1944 and shared the results of experiments done with a new type of antibody. Previously, experiments had been conducted with antisera homologous to two different acid groups. However, in these new investigations, the Caltech researchers used antisera homologous to another type of acid group. In doing so, Pauling and his colleagues were attempting to gauge optimum acidity levels for serological reactions; to identify the types of antigens that most readily cause precipitation; to likewise identify haptens that inhibit precipitation; and to measure the strength of their inhibiting power. Despite Pauling’s extensive involvement in studying reactions of antibodies and antigens, he still had time for other research interests. In February 1945, Pauling and Campbell announced that they had created a usable substitute for blood plasma, the result of three years of work supported by military contracts. Shortly thereafter, Pauling learned a few key details about sickle cell anemia while meeting with the other members of the Medical Advisory Committee. He immediately thought that hemoglobin was involved and went on to experimentally prove that the disease located its source on the molecular level; a first in the history of science. June, July, and September of 1945 each saw the publication of another serological article: Papers IX, X, and XI respectively. The final two of this set featured the addition of a pair of new collaborators. John Bryden, a co-author for Paper X, completed his master’s degree around the time that the article was published, and Arthur Pardee was in the middle of his doctoral program when he worked on Paper XI. Pardee also worked on the experiments described in Paper XIV, although the article was published after he had completed his Ph.D. and returned to Berkeley. Pardee later went on to enjoy a hugely successful career as the Chief of the Division of Cell Growth and Regulation of the Dana Farber Cancer Institute at Harvard Medical School. Papers IX and X shared the results of still more inhibition experiments. The experiments reported on in Paper IX largely confirmed Karl Landsteiner’s discovery on the combining of antiserum and antigen, or antiserum and hapten. Landsteiner had found that less bonding occurred between antibody and antigen or antibody and hapten if the substituent groups on the binding molecule were different from the antigen that created the antibody. The Pauling group confirmed this theory and, in addition, described the forces that affect hapten inhibition. Pauling believed that it had to do with intermolecular forces “including electronic van der Waals attraction…the formation of hydrogen bonds, and steric hindrance,” a supposition that would play a crucial role in later papers in which Pauling explained the incredible specificity that governs the behavior of these molecules. Paper X studied the effect of molecular asymmetry on serological reactions. In this series of experiments, Pauling and two collaborators, David Pressman and John Bryden, had prepared an antiserum with an optically inactive immunizing antigen; e.g., a molecule that does not rotate plane polarized light. However, even though the immunizing antigen was not optically active, the antibodies in the serum combined more strongly with one configuration over an optically active hapten, which does rotate light, than in the other configuration. Pauling and his colleagues hypothesized that this was due to the presence of optically active amino acid residues in the antibody molecules. Paper XI, published in September 1945, discussed reactions of antisera with various antigen substitutes. In this instance, the Pasadena group measured the precipitate formed by these reactions to gauge the inhibiting power of the haptens. They then correlated hapten-inhibiting power to molecular structure, suggesting that if a substance mixed with antisera more readily, then the structure of the molecule might be smaller. They ultimately discovered that if a hapten structure matched an immunizing azoprotein structure, the haptenic group exhibited a strong inhibitory effect. In February 1946, Pauling and co-authors Pressman, Grossberg, and Leland Pence published the twelfth serological article. This was Grossberg’s fourth and final contribution; ultimately, he served as co-author on more of the series than did any other collaborator, save David Pressman and Dan Campbell. 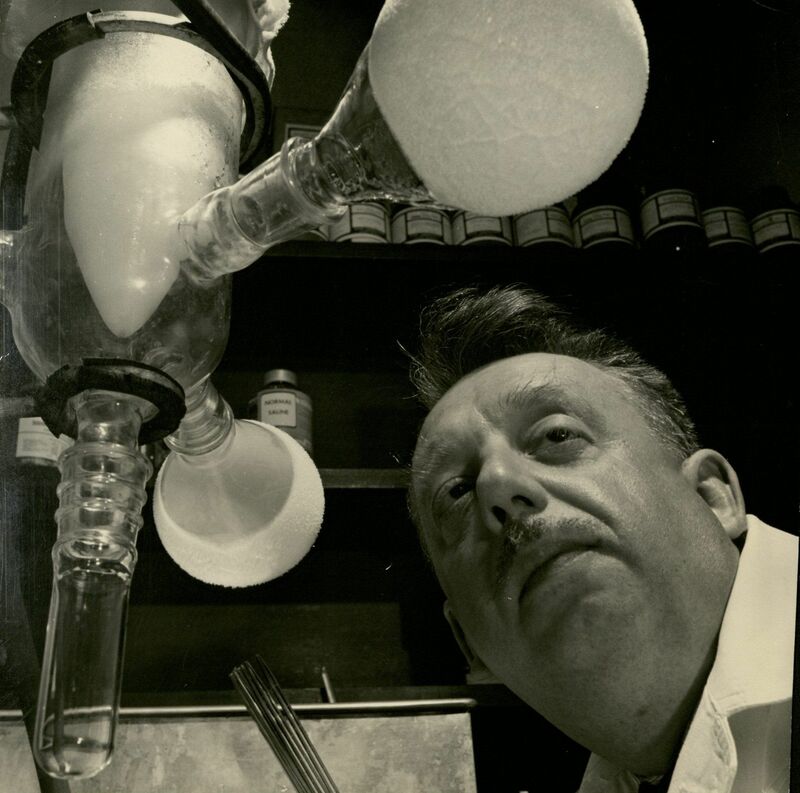 New to the series was Leland Pence, an assistant professor of organic chemistry at Reed College who had been collaborating with Pauling since 1942. Prior to Paper XII, all previous experiments carried out by the lab had used negatively charged or neutral compounds. Paper XII presented the results of experiments that used a positively charged antibody. Pauling and his collaborators found that, even when using positively charged antibodies, hapten inhibition occurred the same way, with the same factors, as was the case with a negative or neutral compound. That said, one important difference that was observed was the ideal acidity for maximizing precipitates; when using a positively charged antibody, the pH required for the optimum amount of precipitate was much lower. The first four papers published by Linus Pauling and his Caltech colleagues on the serological properties of simple substances described general aspects of the precipitation reactions that occur between antibodies and antigens. This work was spurred by a fundamental conundrum: Pauling and many others knew that antibodies and antigens would react to form solid precipitates. However, because the chemical structures of these precipitates were, at the time, so difficult to determine, scientists had been unable to decipher crucial details about the antibodies and the antigens that combined to form them. Pauling’s solution to this problem was to investigate the products of a reaction that utilized, in part, a chemical compound whose structure he already knew. The constituents of these products were a simple organic compound consisting of carbon, oxygen, and hydrogen, combined with one or more haptenic groups – small molecules that spur the formation of antibodies when coupled with a larger molecule. Employing this methodology would, Pauling felt, allow him to better approximate the make-up of the antibody, because the experiment now involved only one unknown structure. In order to run the experiments, Pauling set up a standard protocol for preparing the compounds that he needed. Each experiment required three types of compounds: simple antigens used in the precipitation reactions; immunizing antigens used to create antibodies; and antisera, which are liquids containing antibodies formed through the coagulation of blood. Pauling used this method for all of his serological reaction experiments. Pauling and his collaborators obtained the antisera by injecting rabbits (some of them housed in Pauling’s yard and cared for by his children) with immunizing antigens. The rabbits then produced antibodies to combine with and neutralize the immunizing antigens. Once the last injection was carried out, the scientists drew blood from the rabbits, allowed it to clot, and collected the antiserum. 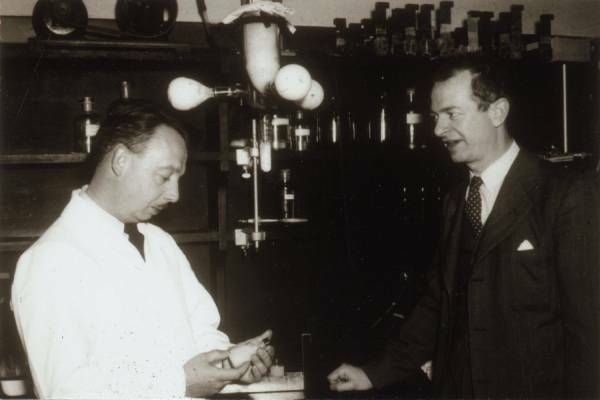 The reactants for Pauling’s experiments – immunizing antigens and simple antigens – were either purchased or prepared by Pauling and his collaborators, typically the graduate students. For each precipitation test, equal portions of antiserum and a saline solution containing a simple antigen were mixed together. Typically, four to six different concentrations of antigen were used. The mixtures stood at room temperature for one hour, then were refrigerated overnight. The next day, a centrifuge was used to separate out the precipitates, which were then washed with saline solution and analyzed. Pauling’s method of analysis involved measurements of nitrogen, arsenic, carbon, and hydrogen. From there, the amount of a given antibody in the precipitate was determined using the nitrogen measurements. The initial set of experiments used twenty-seven different compounds as the antigen, each containing between one and four haptenic groups. All of the polyhaptenic substances – those that had more than one haptenic group per molecule – formed precipitates, but none of the monohaptenic substances did. 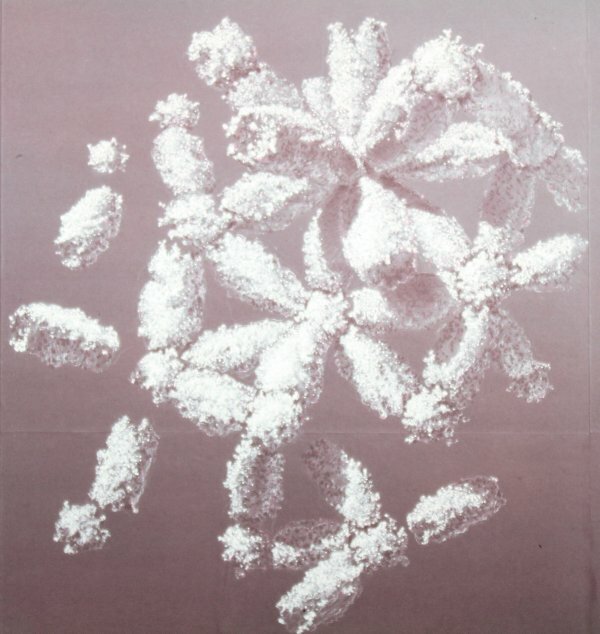 This finding supported the framework theory, devised by the British chemist John Marrack in 1934, that postulated that multivalent antibody molecules could combine with polyhaptenic molecules to form large aggregates, which would become precipitates. On the other hand, Marrack suggested, if multivalent antibody molecules combined with monohaptenic molecules, only small complexes would form and these would not precipitate. Pauling summarized this work in a set of four papers that were published in the December 1942 issue of the Journal of the American Chemical Society. Pauling’s first article, “Precipitation Reactions between Antibodies and Substances Containing Two or More Haptenic Groups,” served primarily to provide support for Marrack’s framework theory. Eight years before, Marrack had stated that antibodies were multivalent; in other words, they can bond to more than one antigen molecule. In order for them to bind in this way, the molecules must be properly oriented such that the binding sites fit together. This causes the formation of a lattice-like structure which grows until it is too large to stay in solution and precipitates out. As noted above, Pauling’s experiments found that “simple antigens containing two or more haptenic groups per molecule were found to give precipitates with the antisera, whereas the seven monohaptenic substances failed to precipitate,” a discovery that confirmed the validity of the Marrack-Heidelberger framework, or lattice theory. The second paper in this installment was titled “The effects of changed conditions and of added haptens on precipitation reactions of polyhaptenic simple substances.” The alterations to conditions that were tested by Pauling included allowing the mixture to rest longer, changing its temperature, and altering its pH. Having confirmed his own belief, in Paper I, that antibodies are multivalent, Pauling used Paper II to first note his assumption – and provide evidence for – bivalence. In addition, Pauling used this paper to publish an equation that could be employed to find the amount of a precipitated compound in a given solution based on solubility, equilibrium constant, and total amount of hapten. Notably, the equation led Pauling to deduce “that in each case the maximum amount of precipitate is produced by an amount of antigen approximately equal to the amount of antibody,” an idea that unfolded more fully in the following paper. The equation published by Pauling in Paper II. Paper III, “The composition of precipitates of antibodies and polyhaptenic simple substances; the valence of antibodies,” further explores the supposition of bivalence through an examination of the ratio of antibody to antigen in precipitates. While the bulk of Pauling’s experiments focused on dihaptenic antigens, some used trihaptenic antigens, and others used tetrahaptenic antigens. Through careful analyses of the different precipitates that resulted, Pauling was able to determine that the ratio of antibody to antigen in any given precipitate was approximately 1:1. The last paper of the first installment, Paper IV, reported the results of initial experiments on the inhibition of precipitation in the presence of hapten. Pauling and his colleagues had tested precipitate inhibition in three basic ways: by altering temperature, by augmenting the amounts of hapten present in their mixtures, and by isolating the effects of twenty-four specific haptens. These experiments found that adding haptens to a mixture of antibodies and antigens inhibited the precipitation of the antibody-antigen complex. Furthermore, Pauling concluded that the structure of the haptens correlated with their inhibition power and detailed the relative values of each hapten’s bond strength. He then used the hapten inhibition data from these experiments to update his earlier equation for finding the amount of antibody precipitated. Next week, we’ll examine eight more papers that Pauling published on the topic over the next three years and explore the ways in which this body of research evolved and expanded during that time.